The chapter looks at Brazilian health cooperation by focusing on one aspect that is often overlooked in studies about SSC: the sociology of SSC workers. The analysis departs from the position of the “cooperantes” that conduct Brazilian SSC based on their own policy experiences at home. By telling the story of how the BHEC was founded, the chapter explores the country’s progressive internationalization through an engagement in minilateral arrangements, such as the MERCOSUL, the UNASUL and the CPLP, as well as structuring SSC projects in health. The latter are referred to here as the South–South cooperation fold in health. The SSC fold supposedly gathers together agents from diverse countries around a shared understanding of health and healthcare in the aid relationship. However, taking the case of the health partnership with Mozambique and the establishment of an antiretroviral factory, the chapter argues that the common vocabulary is always subject to particular interpretations. These depend on the networks and sociohistorical processes in which the expert communities are embedded—that is, the agents’ structural positions. Cesarino, Letícia M.C.N. 2012. 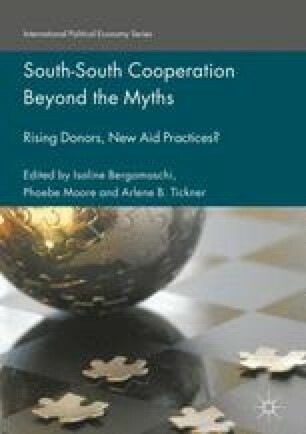 Anthropology of development and the challenge of South–South cooperation. VIBRANT—Virtual Brazilian Anthropology. April 4. http://www.vibrant.org.br/downloads/v9n1_cesarino.pdf. Accessed 25 Sep 25, 2015. Fiocruz. 2012 Centro de Relações Internacionais em Saúde (CRIS). Relatório de Atividades. http://portal.fiocruz.br/sites/default/files/documentos/Relatorio%20CRIS%202012%20b.pdf. Accessed May 25, 2015. Fiocruz. 2013. Centro de Relações Internacionais em Saúde (CRIS). Relatório de Atividades. https://portal.fiocruz.br/sites/portal.fiocruz.br/files/documentos/relatorio_de_atividades_internacionais_2013_da_fiocruz.pdf. Accessed May 25, 2015. Hodges, Tony, and Tibana, Roberto. 2012. Political economy of the budget in Mozambique. [complete final manuscript, 12 December 2004]. http://www.opml.co.uk/sites/default/files/Political%20Economy%20of%20the%20Budget%20in%20Mozambique_0.pdf. Accessed February 15, 2016. Joint United Nations Programme on HIV/AIDS (UNAIDS). 2010. Global Report. UNAIDS Report on the Global AIDS Epidemic. Geneva: UNAIDS. http://www.unaids.org/globalreport/documents/20101123_GlobalReport_full_en.pdf. Accessed August 31, 2015. Pavignani, Enrico, and Joaquim R. Durão. 1997. Aid, change and second thoughts: Managing external resources in the health sector in Mozambique. Maputo, Mozambique: Ministry of Health. http://www.sti.ch/fileadmin/user_upload/Pdfs/swap/swap289.pdf. Accessed July 20, 2015. Vujicic, Marko, Stephanie E. Weber, Irina A. Nikolic, Rifat Atun, and Ranjana Kumar. 2011. GAVI, the Global Fund and the World Bank support for human resources for health in developing countries. Series produced by Health, Nutrition and Population Family. The World Bank’s Human Development Network: 1-16. http://siteresources.worldbank.org/HEALTHNUTRITIONANDPOPULATION/Resources/281627-1095698140167/ AnAnalysisofGaviTheGlobalFundAndTheWorldBankSupportForHumanResourcesForHealthInDevelopingCountries.pdf. Accessed August 10, 2015.